A thorough review of the functioning of several business organizations whether it is small or large has revealed that a lack of proper business accountant has proven worst for such businesses. Businesses can be of various types, and their mode of functioning can also vary. But the basic pattern is the same, and any company aims to maximize profit. Different kinds of activities are evolving every day, but due to lack of proper planning, a very few of them are being able to sustain in the breathtaking competitions. 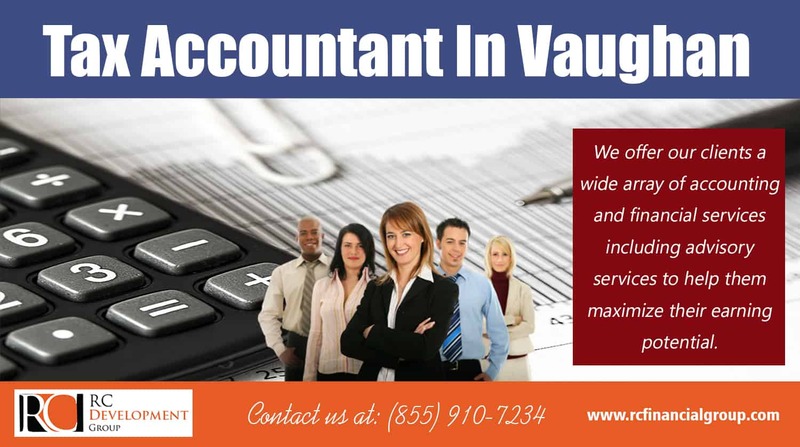 According to the trends perceptible in the last few years concerning business progress or sustenance is that Tax Accountant In Vaughan are of paramount importance to any business. The reasons for the failure of any small business can be various. The factors that have turned out to be the failure for most of the small business concerns are lack of operating capital, poor resource management, using business funds for personal expenses, lack of proper credit facilities, investment without long-term planning, or even too many investments in undesired sectors or improper salary management. Therefore it is of utmost importance to have proper planning before embarking upon any business, and a lot of researches and evaluations of the relative strengths are critical for the purpose to avoid roadblock in the long run. From this point of view small business accountants are very important as in many cases, it has been found that owners of sole proprietorships, partnerships, or limited liability corporations start over with limited or zero knowledge of bookkeeping practices, recordkeeping, payroll, and most importantly state and federal taxes and reports. It is quite a tough ask to run a business smoothly and can even be overwhelming at times without proper resource management. Most often, due to a limitation in funds, business accounting is done by the business owner itself, resulting in penalization for late payment of taxes, new submission of tax documents and so on. Whether your accountant is producing your accounts or carrying out your annual audit, being prepared for them will ensure their work is carried out smoothly and efficiently and with the minimum disruption to yourselves. By establishing and maintaining specific procedures, you will be able to keep better control over your records and your business. It will also mean your accountant can cut down on the work they need to do which may save you some money. They can help you set up these procedures initially and once established you will be able to carry them out yourself. These procedures will include control accounts, reconciliations, and stocktaking. Accountant plays a vital role in handling accounts, books, and records. Advice can be taken to invest in different governmental facilities to save tax and time. Every business includes many activities like recording the account details, cash flow details and managing the records. Good records and accounts give clarity to take the decision and depict the financial position of the business. Hiring a trained accountant can take care of your accounts, cash flow management, and your tax obligations. Leaving your books in safe hands can free up your time, and you can focus on clients and implement plans for business growth. Expert advice can be taken from accountants on how to maximize your benefits and minimize your taxes each year. Small business owners file a tax return on own to save fees paid to the accountant. But this has a risk of filling wrong details or submitting false documents to the government. A trained accountant can supply the complete forms with correct information and provide them on time. The government can penalize for not paying the correct amount of tax on time. By choosing right accountant for your business helps to stay assured that the proper forms will be completed, on right time and in the right way. Accurate and organized records can be achieved by companies hiring expert Accountant that make it quicker to prepare your accounts and help to monitor your company’s cash flow in and out. Completing the forms correctly is important but trying to save some money spend in the tax is more beneficial for business growth. A good accountant will take advantage of every legal way to minimize tax return amount. Keeping watch on the changing market trend and tax policies will also help to save time and money. An accountant will advise operating the business to utilize maximum tax beneficial procedures. Many companies in Ipswich provides services to pay tax return on time. A good accountant can concentrate to increase business sales and profit and pay the least amount of tax using legal methods and ways. New ideas can be implemented to manage the records and books if required in the future to audit. Savings in tax, cost reductions and improved profits can help in business growth and expansion.